Click on the thumbnail photos to read their stories. Kadia thinks she is 15 although she does not know for sure. She is Bamanan, and lives with her mother, two older brothers, two younger brothers and two younger sisters. They live with her uncle in one of the poorest communities in Bamako. Her handicap dates from her childhood when she fell. Her leg began to atrophy and she walks with a crutch. 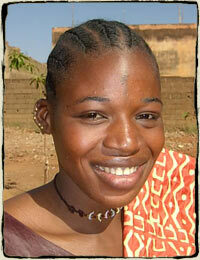 Kadia lived in a village 200 km from Bamako with her father and mother where they were subsistence farmers. Their family was chased from their land by her father's own brothers and they were forced to move to the city to live with an uncle and his family of five children. Shortly after arriving in Bamako, her father died, leaving her mother pregnant yet again. While they had a roof over their heads, they had to fend for themselves as there was not enough to feed everyone. Kadia and her mother both became beggars. When lucky, they received $1 or $1.50 a day, just enough to feed themselves for the next day. Occasionally, Kadia would braid hair and earn an extra $1 - $1.50 perhaps twice a week. When asked her dream, she responded, "I don't have the luxury of dreaming". Despite her disability, Kadia is a master at dyeing fabrics. She has emerged as a leader and is part of the first team to graduate and start her own business. Copyright © 2011 Schillios Development and Schillios Consulting Group.